The great feast of Pokrov, or Protection, comes to us on October 1st. It is one of the favorite feasts of the Slavic Churches, and a great personal favorite of mine. Our Lady revealed herself, holding her veil out over the crowd, and above her, her unique child, the God-Man Jesus Christ, to a pair of fools, and not the leaders of church or state. Given the times we are in, it is holy fools who will probably be the ones to redeem our western society. I don’t know if I am one of them – I am foolish, but not necessarily a holy fool. Its origins lie in events in old Constantinople, either when the city was under attack in the years by the pagan Rus’, or when the Arab fleet threatened. Given that an attack of the Slavic Rus’ warriors may have the cause of the apparition, it’s pretty ironic that it is their descendants who embraced this vision! But then the holy fool who saw her was himself a Slav convert, so perhaps it is fitting after all. In the icon, worshippers have filled the Blachernae church, in which the robes of the Virgin Mary were kept. One sees the patriarch, bishops, the emperor and empress, clergy and nobility, all crammed together under the dome. But who gets to see her? Holy Protection Chapel, in the National Shrine of the Immaculate Conception, Washington DC. I served here as a deacon for Byzantine Catholic services, but sadly never as a priest. Saint Andrew, a Fool-for-Christ’s Sake, and his disciple St Epiphanius, saw the Virgin Mary appear in the dome of the church. She was surrounded by angels and ranks of the saints. Our Lady descended from the dome, escorted by Saints John the Baptist and John the Theologian, and went to the ambon, or bema, which in those days was a raised pulpit in the center of the church. There she bowed her head and began to cry. Finally she spread out her veil over the people, and ascended to the dome, and then disappeared. At this point, the attackers withdrew, and the city was spared. Icons of the feast bring together figures from different time periods, who all have connections to Our Lady and her intercession. But it is Andrew, Epiphanius, and Saint Romanos who are blessed. Romanos was a Jewish convert who lived in the fifth century. He wanted to be a cantor, but stammered and was mocked by many of the clergy after a particularly difficult reading of the Psalter during a service. After his fervent prayers to Mary, he was able to not only sing beautifully, but also to compose theology in poetic forms to be chanted. He is the source of many texts used in our worship to this very day, and composed over 1,000 kontakia in honor of the Nativity of our Lord, Palm Sunday, Our Lady, the saints, and feast days of Our Lord (today we only use the opening verse of the kontakia, but most of them are much longer with 18-30 verses). It is to the two “fools” to whom Our Lady appeared first. This is a reminder to the rest of us of the need for humility and penance. And Romanos holds the scroll with the opening verses of the Liturgy for the day, another reminder that it is children of Mary who hold a special place in God’s heart, and who will be heard by Him through her. 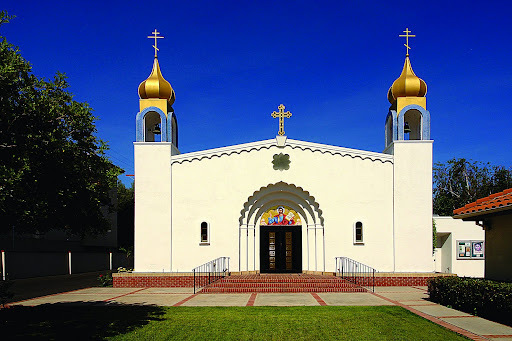 Saint Mary of the Holy Protection – the first Byzantine Catholic parish in the western USA and the first cathedral of the Eparchy of the Holy Protection of Mary of Phoenix. Perhaps Byzantine Catholics are fools for Christ today. We belong to a Church that most Catholics remain ignorant of, and many times don’t trust. When Roman rite churches open with 3,000 households, we start new parishes when we have 25 households, and build up a faith community that has to provide a church and rectory and hall, a resident priest and divine services, catechism, rites of passage from baptism to burial, evangelization, and also pay for salary, utilities, property insurance, medical insurance, upkeep, copying, internet, and a thousand other things. Our numbers have plunged from about 300,000 when I was ordained to under 85,000 today. Our faithful have been persecuted by the communists, the Orthodox, and their fellow Roman Catholics and now face consumerism and the curse of religious indifference. We don’t have enough priests or deacons, and far too many people are deprived of our beautiful worship as a result. Too often we hold back from being bold missionaries, and too often the Holy See does things that leave us scratching our heads in bewilderment. But like good holy fools, we trust in God, we plunge ahead and trust in His great mercy. Holy Mother, watch over us! « A busy week of news! Truly wonderful insight into the Pokrov of the Most Holy Theotokos!!! Some thoughts by Fr. Chris Zugger on one of my favorite Marian Feasts. Thank you for this wonderful post, Father! The Feast of the Holy Protection of the Mother of God is the patronal feast of our parish here in Morgantown, WV. God bless!